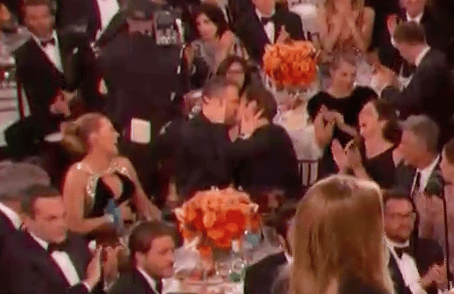 Ryan Reynolds and Andrew Garfield completely upstaged Ryan Gosling’s Golden Globes win with an impassioned kiss in the crowd. Now it doesn’t really matter why, though we’d love an explanation, but the two actors grabbed each others faces and went for it while Gosling walked up to collect his award for Best Actor in a Musical or Comedy. Perhaps Deadpool and Spiderman were both vulnerable and needed consoling after Reynolds lost out to his Hollywood compeer, and Garfield had to watch ‘the one that got away’ Emma Stone collect her award. Could you ask for anything more supportive than a big smooch. 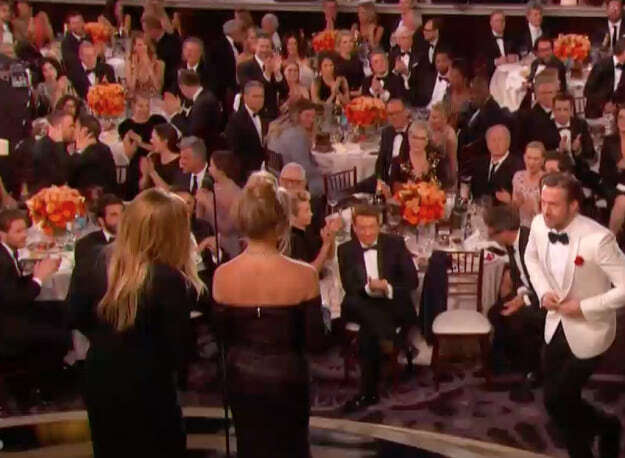 Blake Lively can be seen laughing her head off at the antics while Jake Gyllenhaal is at the opposite side of the table, blissfully unaware of the ardent affair behind him. #Randrew and #Reynfield and now trending on Twitter… a new bromance is born. Garfield and Stone have been dating on and off for four years, and broke up in October, though they both maintain they still love one another. I imagine the lip lock with a supportive friend like Ryan Reynolds made some of the pain go away.